The Department of English Philology and Translation named after D. I. Kveselevych was first formed as the Department of English Philology in 1982. Initially it was run by V. Sasina (Cand. Sc. (Philology), Associate Professor). Later it was headed by Prof. D. Kveselevych, Dphil. One can hardly overestimate his personal contribution to the development of Linguistics and the organization of scientific research within the Department. Being a many-sided personality, a prominent scientist, a poet and an Expert Teacher, D. Kveselevych worked at Foreign Languages Faculty of Zhytomyr State University from August 1961 to February 2003. Prof. D. Kveselevych is a well-known lexicographer. His scientific research comprises over 100 fundamental scientific works, including 7 comprehensive dictionaries. D. Kveselevych was issued Man of the Year Award (1999) and American Medal of Honor (2000) by American Biographical Institute. Collections of scientific papers “Issues of Germanic Philology and Methods of Teaching Germanic Languages” and “Current Issues of Romano-Germanic Philology”, published under his supervision, are among collaborative works of the Department. In 1992 the post-graduate course in Germanic languages (research field ref. no. 10.02.04) was established at the Department of English Philology and Translation. It trains qualified specialists for Zhytomyr State University and other higher educational institutions of Ukraine. 18 thesis defenses have been successfully conducted since 1992. Currently 21 students are takeing the postgraduate course. Scientific supervisors and postgraduate students closely cooperate with scientists of higher educational institutions of Ukraine, in particular with Taras Shevchenko Kyiv National University, Vasyl Karazin Kharkiv National University, Kyiv National Linguistic University. Associate professors of the department, as well as outstanding scientists of leading Ukrainian institutions of higher education supervise the work of postgraduate students. Many well-known Ukrainian scholars in the field of modern linguistics get involved as visiting professors to give lectures and seminars to postgraduates. The results of researches conducted by professorial and teaching staff, as well as by students and postgraduates, are discussed during annual conferences dedicated to the memory of Professor D. Kveselevich. The conferences are held at the Training and Research Institute of Foreign Philology of Ivan Franko Zhytomyr State University. The works of the language enthusiasts are discussed at Ukrainian and international conferences (within Ukraine and abroad) and are published in specialized scientific journals. 6) Pragmatic Aspects of Communication and Translation (Scientific supervisor — S. Topachevskii, Cand. Sc. (Philology), lecturer). The Department of English Philology and Translation is famous for its Linguistic School “The Issues of Semantics in the Context of the Structural and Functional Information Theory”, which has been running in the Training and Research Institute of Foreign Philology for more then 25 years. The School was founded by Prof. D. Kveselevych in 1985. The scholar died prematurely in 2003, but his research has been carried on by his colleagues and pupils and today the School works quite efficiently. Among the members of the School are: 1 professor, 17 Candidates of Sciences (Philology), 21 postgraduates and many students. The School is currently run by Prof. A. Syngaivska. A. Synhayivska authored a plethora of research papers and co-authored 11 training manuals accredited by Ministry of Education of Ukraine. Prof. A. Synhayivska has been a scientific advisor to 6 post-graduate students who conferred candidate’s degrees in Germanic languages (research field ref. no. 10.02.04). Managing local, national and international conferences, workshops, round-table talks, philology-related symposia etc. Presently, the in-house language enthusiasts are engaged in investigating modern linguistics issues, which primarily involve lexicology and grammar semantics, communicative and cognitive linguistics, pragmalinguistics, linguistic manipulation theory, gender linguistics, linguistic culturology, statistical linguistics, stylistics and lexicography etc. Scientists of the department supervise the research of postgraduate students in Germanic languages (research field ref. no. 10.02.04). Currently 21 students are taking a post-graduate course. Department researchers cooperate with scientists of other institutions of higher education, namely, Taras Shevchenko Kyiv National University, Vasyl Karazin Kharkiv National Univerisy, Kyiv National Linguistic University, Mariupol State University, Baranovychi University (Belarus). Cooperation agreements are arranged with the department of English translation (Vasyl Karazin Kharkiv National Univerisy) headed by Prof. L. Chernovatyi, Dphil., and laboratory for lexicographic research (Kyiv National Linguistic University) headed by Prof. V. Perebyinis, Dphil. Functional Linguistics Research Center, which bears the name of Prof. D. Kveselevych, functions at the Department of English Philology and Translation. The Center was founded by Prof. A. Synhaivska in 1999 as a part of the Linguistic School. The work of the Center is characterised by thorough analysis of language units, combining cognitive and communicative approaches. Researches, conducted by scientists and postgraduate students of the Department, reflect the devepolment of language and aim at revealing the communicative potential of language means. Structural and semantic properties of English language units (morphological, lexical, syntactical, textual) are investigated with consideration to their parametric and functional characteristics, as seen in scientific research of Prof. A. Synhaivska, Cand. Sc. (Philology), Associate Professor N. Borysenko, Cand. Sc. (Philology), Associate Professors of the Department of English Philology and Translation Andrii Zornytskyi, Cand. Sc. (Philology), Oleksandr Moseichuk, Cand. Sc. (Philology), Maryna Polkhovska, Cand. Sc. (Philology), Yuliia Nidzelska, Cand. Sc. (Philology), lecturers Olena Mosiienko, Cand. Sc. (Philology), Serhii Topachevskyi, Cand. Sc. 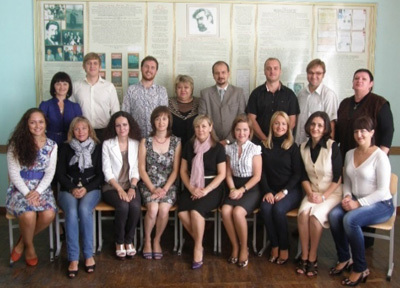 (Philology), Volodymyr Prokopenko, instructors Svitlana Viskushenko, Yurii Karpinskyi, Volodymyr Kuznetsov, Olha Ometsynska, Tetiana Revchuk, Olha Samochornova, Dmytro Shcherba, post-graduate students Iryna Asmukovych, Nadiia Horbachova and others. The aim of the Functional Linguistics Research Center is to initiate and coordinate research in functional linguistics; help young scientists conduct researches, create student task groups, coordinate their activities; introduce new material into scientific use. Members of the Center pay much attention to the organization of research among students. They manage scientific task groups, engaging students in research in the field of English philology. The Center runs scientific workshops involving researchers from the Department of English Philology and Translation, the Department of Crosscultural Communication and the Department of English Language. Participants share their achievements, discuss recent linguistic advances and debate on problematic issues. Dmytro Kveselevych Functional Linguistics Research Center promotes international cooperation, attracts leading Ukrainian and foreign scientists for research in the field of functional linguistics. Top Ukrainian scientists are invited to give lectures and seminars on topical issues of modern linguistics. These are the lecture series given by Prof. T. Kyiak, Dphil. (Head of the Department of German Translation, Taras Shevchenko Kyiv National University), Prof. L. Chernovatyi, Dphil. (Professor of the English Translation Department, Vasyl Karazin Kharkiv National University), scientific workshops of I. Frolova (Cand. Sc. (Philology), Associate Professor of the English Translation Department, Vasyl Karazin Kharkiv National University). In 2011 the research laboratory “Theoretical and applied aspects of speech influence” was founded by associate professor Oleksandr Moseichuk, Cand. Sc. (Philology) on the basis of the department of English Philology and Translation. The lectures of the institute as well as the postgraduate students of the department contribute to the work of the laboratory. The main aim of the research is the development of models to influence on the personality or group as well as the elaboration of methodical recommendations as to the implementation of the received results in scientific and methodical work. Carrying out meetings on discussing the questions of methodology of the researche, outlining the material and aspects of studying the phenomenon of speech influence. Preparation of the reports and the publication of scientific articles on the subject. Preparation of scientific and methodical materials for the course “Theory of speech influence”. The supervision of term, master’s and dissertational papers dealing with the aspects of speech influence. The edition of the multi-author book on the subject of research.